How Captain Britain turned down his knighthood. | The Captain Britain fans' page and blog. How Captain Britain turned down his knighthood. Captain Britain is such an honorable gent that he seeks no reward for his brave actions, why did you know he even once rescued the Queen and wouldn’t accept anything for it. The story starts in Captain Britain issue 37 from 1977, announced as a silver jubilee spectacular it seems by issue 39 Cap has decided to celebrate the Queens ascension to the throne in rather an unusual way. So you’re probably thinking how on earth is Captain Britain going to make the honours list by attacking the Queen, more on that in a moment as this page deserves a few quick comments. Firstly I love how the hypnotized Captain Britain is addressing the Queen as “the female tyrant, ” then there is how the Queen is looking quite unconcerned at being attacked or the totally uncharacteristic chivalrous behavior of Prince Phillip. Now don’t get me wrong this story is insane even by seventies Marvel standards but I love it in fact it features in my top 5 Captain Britain stories and you can read just how mad the plot is there. Issue 39 also ends with what might be one of my favorite Captain Britain cliff hangers of all time. Yes the Royal Navy is that devoted to the Queen that she only has to say the word and they will conquer a fictitious African nation for her, of course it all ends well as Captain Britain averts the war and rescues the Queen. 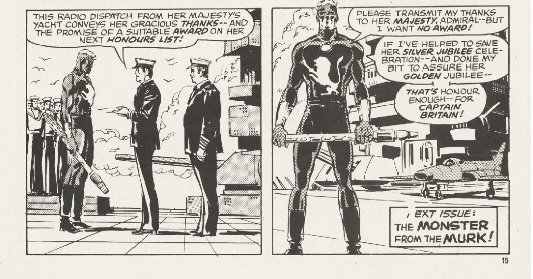 Anyway at the end as thanks for his help the Queen sends a message from her yacht that Captain Britain will get an award for his help but being the valiant soul that he is Cap turns it down. And that’s why Captain Britain is such a great hero, titles are not for him he finds honour in his actions and deeds alone. Hurrah ! As I read this story again I was struck by its sheer audacity and how I’m sure if this was a Captain America adventure I don’t think Marvel would ever have him attack the President (unless he was an undercover Skrull. ) Other later Marvel comics attempts to involve the royal family especially the time X-Statix nearly teamed up with Princess Diana never saw the light of day and I can’t imagine a story like this getting the green light today. In conclusion I’m just glad that at the end of this wonderfully daft comic that Captain Britain came out with his honour and integrity intact, he doesn’t really need a knighthood as being Captain Britain is surely reward enough in its self. 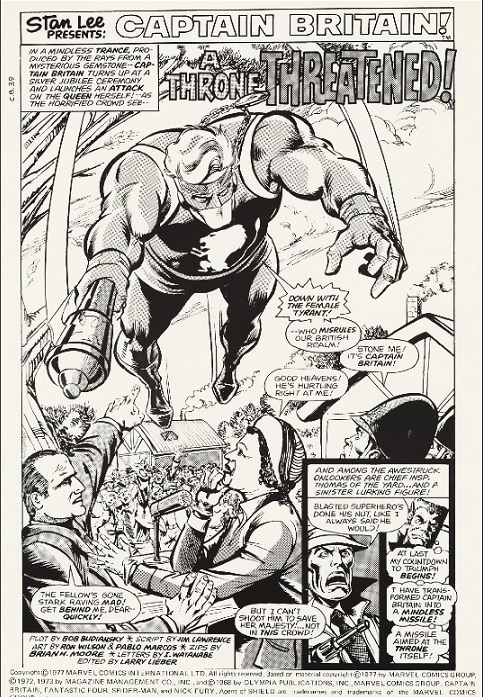 This entry was posted in Great Captain Britain moments and tagged Captain Britain 39, Captain Britain attacks the Queen, great Captain Britain moments, Umbazi by Richard. Bookmark the permalink. Pingback: Captain Britain meets the Prime Minister | The Captain Britain Blog.